Benefits of pumpkin fruit for health are enormous. Yellow squash or pumpkin is a food rich in vitamin A, C and E, minerals, and carbohydrates. The flesh also contains antioxidants as protection against various types of cancer. Pumpkin fruits are generally round and large. Skin deep golden brown color, while the flesh is dark yellow and thick. It was sweet. Having a very thick skin and hard, so it can act as a barrier to the respiration rate of water discharge through the process of evaporation, and the inclusion of air causes oxidation process. This is exactly what causes pumpkins relatively durable compared to other fruits. Can achieve lasting six months or more, depending on how the storage. Pumpkin is a food that contains calories, carbohydrates, protein, fat, minerals (calcium, phosphorus, iron, sodium, potassium, copper and zinc), ß-carotene, thiamine, niacin, fiber, and vitamin C. Superior nutritional content pumpkin is the content of ß-carotene which is a pro-vitamin A (a source of vitamin A), in the body is converted into vitamin A, which serves to protect the eye (cataracts attacks) and skin, immunity and reproduction. Therefore pumpkin is known as the "king of beta-carotene." The flesh also contains antioxidants that are beneficial as an anti-cancer. Pumpkin seeds indeed are an excellent source of dietary fiber and mono-unsaturated fatty acids, which are good for heart health. In addition, the seeds are concentrated sources of protein, minerals and health-benefiting vitamins. Pumpkin contains compounds alpha-carotene, antioxidant, lutein and zeaxanthin. These nutrients can prevent premature aging, maintain eye health and prevent cataracts, and macular degeneration can lead to blindness. The compound alpha-karotein, vitamin A, C and zinc in pumpkin acts as a natural remedy to slow the aging process, prevent wrinkles and smooth the skin. 3. Reduce the risk of hypertension. The potassium in pumpkin may help reduce the risk of high blood levels in the body. Relatively high fiber content which is very good for keeping the digestive tract system and prevent constipation. Pumpkin contains zinc which is good for strengthening bone mass and prevent the body's cells are damaged by free radicals. Eating pumpkin in sufficient also can prevent osteoporosis. Pumpkin is rich in beta-karotein antioxidants that can be used as an anti-inflammatory. Eat pumpkin on a regular basis to prevent the deposition of cholesterol in arterial walls that can reduce the risk of stroke. Moreover potassium content in pumpkins, can support smooth metabolism. This is important in maintaining the balance of water and electrolytes (acid-base) in the cell body. Pumpkin is also rich in good fatty acids in the protein that skin needs and also contain vitamin E, zinc, and magnesium which serves to make the skin more radiant. Eating pumpkin can also encourage the regeneration of skin cells and fight bacteria that cause acne. Vitamin E is a powerful antioxidant that helps skin repair process. 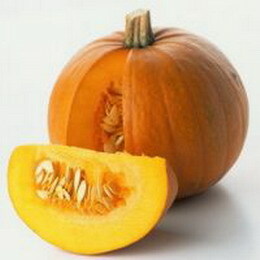 Zinc contained in the pumpkin can also be a acne remedy.